President Warren Harding was the 29th President of the United States and served in office from 1921 to 1923. During his time in the White House, Harding had an Airedale named Laddie Boy. It was said that Laddie Boy had a hand carved chair that he would lay in during cabinet meetings. It was also said that Laddie Boy would beg dinner guests for food a time or two. Bad doggy! 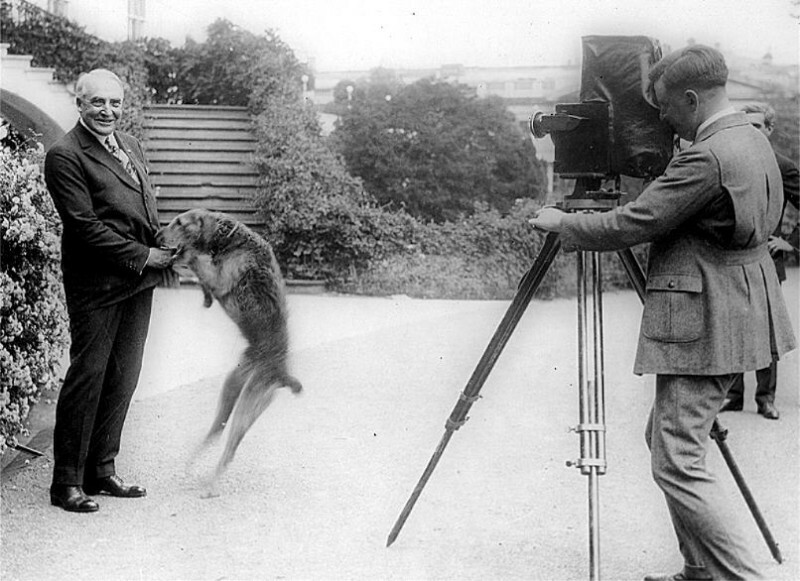 Warren Harding was considered the “Father of the First Dog”. 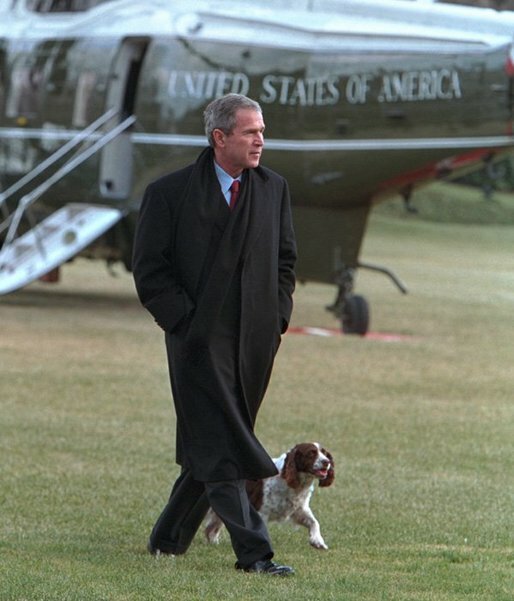 George H Bush, 41st President of the United States, had a Springer Spaniel named Millie. Millie became quite popular over at the White House, perhaps the most famous Presidential dog in history. Millie “wrote” a best-selling book called Millie’s Book: As Dictated to Barbara Bush, Barbara being the First Lady of course. The book outsold the President’s auto-biography! Millie was a very pretty dog and she made it onto the cover of Life Magazine alongside Barbara Bush when she gave birth to a litter of puppies. One of these puppies became George W Bush’s White House pet. In 1989 Washingtonian Magazine labeled Millie as Washington’s “ugliest dog in the city”. The President took offense to the magazine picking on his dog because his dog was actually quite pretty. Many said Bush’s love for his beloved canine increased his relatability and likability as a President. 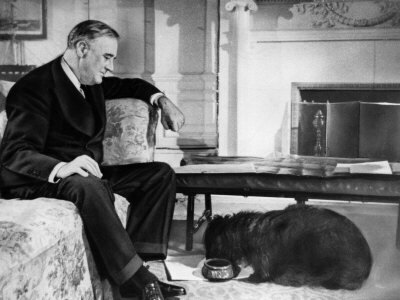 Franklin Roosevelt, or FDR, was the 32nd President of the United States and had a Scottish Terrier named Fala during his time at the White House. Fala went everywhere with Roosevelt and was thought as possibly one of the most photographed dogs in the world. It was said that Fala once went missing in the Aelutian Islands and Roosevelt sent a U.S. Navy ship to find the dog. Stories like this is one of the reasons why Fala was followed so much by the media. Fala outlived FDR by 7 years and now you can see a statue of both Roosevelt and his beloved pooch in Washington, D.C. at the Franklin Delano Roosevelt Memorial. Theodore “Teddy “Roosevelt was the 26th President of the United States and had two terriers named Skip and Jack; Skip was the more famous of the two. In the book, Theodore Roosevelt’s Letters to His Children, Skip is mentioned several times. In the first letter mentioning Skip, it looks as though TR found him when he was out hunting bears and bobcats. He states that the dog was a part of John Goff’s pack and the dog really took a liking to him and followed him around, so he decided to take the dog home to his son, Archie. Skip was mentioned 6 other times in the book where TR states that the dog was once good for hunting but now he just wants sleep all day and become a lapdog. Skip passed away during Teddy’s time at the White House and he was buried on the grounds. Once Teddy’s Presidential time was up, the dog was exhumed and reburied at the Roosevelt family estate in Sagamore Hill. Richard Nixon was the 37th President of the United States. Nixon had a cocker spaniel named Checkers who was a gift from a Republican supporter. Checkers became a part of one of the more famous campaign speeches made by Nixon in 1952. It wasn’t illegal to keep gifts that were given by Presidential backers, it was just simply frowned upon because allegations of possible conflict of interest would arise. Nixon vowed nationally, in what is now titled the “Checkers Speech” that he would never give up the family dog that his daughter had named. Some say this evoked a large sympathy vote. George W Bush was the 43rd President of the United States. Both Bush’s dogs, a Springer Spaniel named Spot and a Scottish Terrier named Barney, became famous for different reasons. Spot’s mom was George H Bush’s dog Millie. Spot was born in the White House in 1989 during George Bush Sr’s Presidential term. Spotty’s full name is Spot Fetcher Bush. Spot would follow George W Bush around the White House and became a loyal companion for 15 years. The dog was put to sleep after suffering several strokes in 2004. The White House cat came to be thanks to Spot, who found the cat hiding in a tree on the grounds of the White House one day. Barney became famous, or infamous let’s say, after biting two different reporters on two separate occasions. Laura Bush, wife of the President, joked that this was Barney’s way of saying he was “done with the paparazzi.” Barney’s infamy grew after Bush was criticized for having such a “puny” dog as such an “influential” world leader.